We’d love your help. Let us know what’s wrong with this preview of Silent by David Mellon. For fans of The Book Thief and Raiders of the Lost Ark, this thrilling new novel set during World War I features a girl who must pretend to be a male soldier to save her younger brothers. Adi is an outrider, rejected by both her British father’s and Indian mother’s cultures, so she is no stranger to trouble. But when a mysterious agitator called “Coal” kidnaps Adi’s twin br For fans of The Book Thief and Raiders of the Lost Ark, this thrilling new novel set during World War I features a girl who must pretend to be a male soldier to save her younger brothers. To ask other readers questions about Silent, please sign up. Okay, um, wow. Silent by David Mellon is such a captivating read. It's perfect for fans of Historical Fiction since it is set during World War I but it will also appeal to readers who love a bit of magic and mystery! This book is about the struggles of a young Indian-British girl who is unfortunate to be caught up in the schemes of a stranger called Coal. Having messed up his plans, he kidnaps her twin brothers and gives her a mysterious pocket watch containing four riddles to solve within a four and a half year countdown in case she ever wants to see them again. As an extra note of precaution, Coal takes away her ability to speak and forbids her to write for help or he will harm the twins. Thus begins Adi's mad race to solve the puzzle, taking her from the comforts of a mansion straight to military action of World War I. To be honest, I was not expecting Silent to be such a thrilling read. I love historical fiction yet it's been a while since I became so invested in one. Maybe it helped that it has magic (I love magic), but I believe it mostly had to do with the wonderful characters and how we learn the history of each of them. My favorite character is of course, Adi. She's smart, selfless, and incredibly brave. Her voice is taken away, but she finds other ways to get herself heard. It's amazing how by the end of the novel, she has so many people trying to help her! I also loved George, who is the first guy to take Adi seriously and gives her the push she needs to keep solving the riddles. I fell for him hard (something I wasn't expecting from this novel). But the one character who stayed with me is Doc. He's the father figure that Adi needed in her time working in military camps and his support was elemental for her survival. The thing that I really don't know how to explain is the magic inside this book. It's strange and mysterious, all part of the enigmatic Coal (who is the one that throws Adi into this quest). I mean, I call it magic because how else to explain Coal's unusual abilities? But you know, I believe Silent perfectly portrays how some things in history, events that happened AND happen in real life, sometimes cannot be fully understood or explained. And how this mystery is all part of the charm, the thing that sets room for speculation. In any case, I enjoyed it! SPOILERS I have discovered that I love reading historical fiction, and it is because of writers such as David Mellon, the author of this book, that I love reading this genre so much. I thought the writing was engaging and the plot very novel. It's set during World War I which I know little about so it was interesting to learn a little as I read. The MC is a young multicultural girl named Adi who is of both British and Indian descent. The story piqued my interest from the get-go when Adi botched up the plans of a man named Coal, so he takes his revenge by kidnapping her twin brothers and giving her a pocket watch. In addition, he gives her four riddles to solve but she has to solve all the riddles within four plus years, if she wants to see them again. As if that wasn't bad enough, Coal makes it extremely difficult for her by practically putting a spell on her because during the time she's trying to solve the riddles, she cannot speak...EVER...to anyone...or harm will come to her brothers. As Adi searches and tries to solve all the riddles, she ends up having to dress as a boy soldier, which really kept me on the edge of my seat a few time. I loved Adi's character, being a strong female who somehow managed to withhold her tongue and yet somehow communicate with others. Ask that of any woman and who would be able to do it, even for the love and safety of siblings or other loved ones. At one point she had to impersonate a soldier and how on earth she did that without using her voice I will never know, other than she is very strong-willed and brave as well to try passing as a male soldier. Coal was infuriating, but he was the villain I loved to hate. His character is believable as a really BAD guy who cares not what Adi or her poor brothers might be going through as all three go through their own kind of hell. George was the character I loved for how much he tried to help Adi. I'd say he was her helper because he gave her the impetus to continue looking for her brothers and solve the riddles when she might have just given up. Another aspect of this book is there is magic in it, but it's rather subtle, I think. I can't say for certain but there definitely seemed to be magical elements throughout the story that I would say, "there is magic in this...there has to be." I wish I could do this book justice but it's next to impossible to convey how much this book captured my attention intellectually, creatively, and imaginatively. David Mellon hit a home run with this one, and although the book is titled Silent I know I will be anything but silent about his book. I am looking forward to the second book to see what happened from the point book 1 left off! I rather enjoyed this book. It was interesting and full of surprises. It is a very engaging read, definitely recommended for adults and young adults. Adi, an Indian-British young woman, is tasked with looking after her twin half brothers just before the start of World War I. She was used by Cole (the devious creature that he is, never quite sure what he is but he is definitely a mischievous war causing creature), to try and harm an army official, only I received a free copy through Goodreads. Somehow Adi is able to come across a lot of interesting and very helpful people, who help her along the way. Especially during war torn Europe during the height of World War I, which isn't easy for a young girl, and even more so an Indian-British girl. "I guess that's what Hell is, really. Just the place where no one asks any questions anymore." This was a wonderful adventure of a story. The background of the war, the story is about one day where Adi found herself in a foreign land with 2 boys to look after. That stress wasn't enough, the same day the boys are kicked out of school, Adi is fired from her job after a strange encounter. But that was not the end to her strange moments - she nearly loses her life that day, along with her voice and he "I guess that's what Hell is, really. Just the place where no one asks any questions anymore." But that was not the end to her strange moments - she nearly loses her life that day, along with her voice and her brothers. Toen ik dit boek vanmorgen begon te lezen had ik geen idee dat ik het nog dezelfde dag uit zou krijgen. Maar dat is een perfect voorbeeld van hoe moeilijk de auteur het maakt om dit verhaal los te laten. Het boek is YA met een literair glanslaagje maar laat zich erg moeilijk onderverdelen in een subgenre. Hoewel ik het boek geen eer aan doe met mijn vergelijking wil ik jullie toch een klein idee geven van wat je te wachten staat in dit boek: denk aan een combinatie van de films 'Cold mountain' en Toen ik dit boek vanmorgen begon te lezen had ik geen idee dat ik het nog dezelfde dag uit zou krijgen. Maar dat is een perfect voorbeeld van hoe moeilijk de auteur het maakt om dit verhaal los te laten. Hoewel ik het boek geen eer aan doe met mijn vergelijking wil ik jullie toch een klein idee geven van wat je te wachten staat in dit boek: denk aan een combinatie van de films 'Cold mountain' en 'Labyrinth'. This review has been hidden because it contains spoilers. To view it, click here. I enjoyed " Silent " by David Mellon so much! I got a autographed book from David which I will cherish, and lovingly pass on to my granddaughters. Ali had to grow up so fast being given the responsibility of her twin half brothers at the age of 15. The circumstances are complicated enough as when they arrived in France planning on meeting their grandmother, only to find she had passed only days before they arrived by ship. As luck would have it things get worse from there. Read and enjoy. I recomm I enjoyed " Silent " by David Mellon so much! I got a autographed book from David which I will cherish, and lovingly pass on to my granddaughters. wow wow wow!! so good and strange and cool! What drew me into Silent at first was the beauty of the writing. The author paints with words, and you can completely visualize the scenes that the characters are in. But then the uniqueness of the characters, and the tension of World War I as well as the mysterious villain that oppresses the lead character Adi became the most captivating parts. Though it is aimed at young adults, the author treats the reader with maturity and sophistication, and never takes the easy storytelling path. This book What drew me into Silent at first was the beauty of the writing. The author paints with words, and you can completely visualize the scenes that the characters are in. But then the uniqueness of the characters, and the tension of World War I as well as the mysterious villain that oppresses the lead character Adi became the most captivating parts. Normally, when I read YA, I tend to go for the straightforward contemporary storyline rather than the more popular fantasy or dystopian concepts. I also, in general, don’t read much historical fiction. However, after finishing SILENT, I’m reconsidering my reading habits, although I think I’ll be hard pressed to find something this uniquely beautiful and magical again. 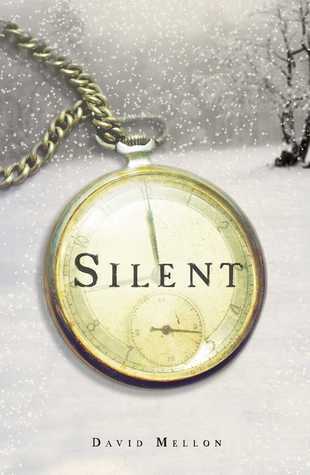 SILENT is not just a historical fiction YA novel which is what I initially thought going in. It’s so much more than that. Yes, it Normally, when I read YA, I tend to go for the straightforward contemporary storyline rather than the more popular fantasy or dystopian concepts. I also, in general, don’t read much historical fiction. However, after finishing SILENT, I’m reconsidering my reading habits, although I think I’ll be hard pressed to find something this uniquely beautiful and magical again. SILENT is not just a historical fiction YA novel which is what I initially thought going in. It’s so much more than that. Yes, it’s set in WWI and the war plays a role in the story for sure, but the beauty of the novel lies in the characters and the world that Mellon creates for them. Adi is fifteen years old with a British father and Indian mother. She’s sent from India to Europe, in charge of her twin stepbrothers, Xander and Xavier. Nothing goes as planned once she arrives, but it’s when she crosses paths with the mysterious Coal that her world is thrown into chaotic upheaval. Coal, a menacing powerful figure, kidnaps her stepbrothers and Adi has a finite amount of time to find them. The only problem is she can’t talk or write, and all she has to go on is a watch and a set of riddles. If this sounds strange and confusing, it is and it isn’t. What transpires is a lovely yet harrowing story of courage, perseverance, and the role that chance, and perhaps a little bit of magic, plays in all of our lives. We meet a unique cast of characters that Mellon expertly weaves into a storyline that rockets towards a tense and explosive climax. A must-read lyrical gem that mixes action-adventure with gorgeous prose. If only the female protagonist's character was as fleshed out as the male supporting characters. Weird how the author was able to make the men fully-formed humans, but not the woman central to the entire novel. I read Silent by David Mellon. I had got it for free from Goodreads. I thought it was a good book with a great concept and good strong characters. It was a very quick and easy read. A great book to read when you have enough time to breeze through a easy read. David did a good job with a fresh new take on a know war. I would recommend this book to anyone of any age. This book was really interesting and a good read, the only thing that confused me were the different perspectives and who/what Coal is. I love the story plot of this book, loved the characters, couldn't put it down. But it did jump around too much for my liking. Sometimes I had to back read to see if I missed something till I learned to keep reading and he would eventually fill you in on which character and when. Still a highly recommended book. Loved the story! The author had a unique way of writing. I also loved the historical aspect of the plot. The character of Coal is left very open-ended, and till the end the reader never really knows why Adi was chosen but even then, the story fully captured my attention and left me satisfied. Beautifully written and an amazing read. I loved it! I received this book though a giveaway on Goodreads.com. For some unknown reason I started it a while ago, read 40 pages and put it aside. I picked it up again this week and couldn’t put it down. An amazing story set during WWI of a brave girl who overcomes so many difficulties and manages to save her brother’s lives. The girl does not speak but somehow manages to make friends, fall in love, perform surgery, pass as a male soldier. The book is fast paced but weaves a great story. SILENT by David Mellon is quite cinematic, which makes sense as the author has been a storyboard artist in the film and television industry for the last thirty-five years. All of the descriptions in this historical fantasy, whether they are people or places, are primarily visual, so much so that it is easy to picture the world Mellon has created. Even the page breaks he uses are reminiscent of a movie edit, where in the middle of a linear story, a flashback or additional information can be spliced in without an intro or an outro. The novel is split into three parts, similar to the typical three act structure of most screenplays. While some books could never be adapted easily into a film, SILENT is the perfect candidate. Consequently, this novel is a great way to introduce young readers to the World War I era. Not only is SILENT accessible and easier to read thanks to its cinematic nature, but the fantastical element is also very entertaining. SILENT follows young Adi, who stumbles upon misfortune when a mysterious man named Coal kidnaps her two younger brothers. Coal gives Adi a gold watch that contains four riddles. Once Adi can solve all of them, she will be able to find out where her brothers are being kept. The only caveat is that her time to find them is limited and she is not allowed to speak or write. Between Adi’s quest, a royal family, and a landscape of foreign lands, SILENT has the recipe for a great novel. I did, however, wish to have a more conclusive ending. I was waiting the entire book to find out exactly who Coal is, what motivates his behaviors, and why he has a bug collection. I was also curious why Halick’s behavior changes so drastically. Was that also Coal’s doing or did Halick suddenly develop morals? Finally, how will Adi survive now and where is her father? In other words, there are many unanswered questions, even more than the ones listed. Mellon alludes perhaps to a second book set during World War II, which hopefully would address these issues. In the meantime, I would not be surprised if Mellon puts on a director’s cap. SILENT is definitely a movie I would go see, let alone a novel that will be enjoyed by all who love history, romance, magic, and adventure. I received this book free through Goodreads First Read. Interesting idea. I liked the challenge Adi faced when trying to find her brothers without talking. I feel like some kids will not understand parts or locations if they are not familiar with WW1. The story shifts through time: 1868 up to 1918.
the battlefields of Europe in order to rescue her two brothers. A story, or plot, driven book, Silent did a great job of keeping me invested, not only in the mystery, but also in the characters. I found them all interesting and believable. The villain, always a determining factor in such books, was creepy, sometimes otherworldly, and coldly calculating. But he also very human in surprising ways. He made me curious, and drew pity, even sympathy, from me at times. While this is a YA novel, I would really recommend this compelling novel to anyone middle grade or A story, or plot, driven book, Silent did a great job of keeping me invested, not only in the mystery, but also in the characters. I found them all interesting and believable. While this is a YA novel, I would really recommend this compelling novel to anyone middle grade or older. Personally, this book held me captive from beginning to end. While there were a few lulls near the middle of the book the initial premise and promise of the novel pulled me through and I found it well worth the time and effort of seeing it through to the end. 4.5/5. I mayyyy have a slight obsession for odd but lovely fairy tale retellings. If Shakespeare, World War I, and the Six Swans (the one where the princess has to rescue her older brothers turned into swans and stay silent the whole time) were to meet, this would be that book. The pacing is pretty fast and the story is only mostly in chronological order (we follow Adi, our British-Indian heroine, throughout, but we get flashbacks). Normally I'd complain about the lack of (written) development of charac I mayyyy have a slight obsession for odd but lovely fairy tale retellings. If Shakespeare, World War I, and the Six Swans (the one where the princess has to rescue her older brothers turned into swans and stay silent the whole time) were to meet, this would be that book. The pacing is pretty fast and the story is only mostly in chronological order (we follow Adi, our British-Indian heroine, throughout, but we get flashbacks). Normally I'd complain about the lack of (written) development of character, romance, backstory, etc, but David Mellon does such an excellent job of showing, not telling, that it's not necessary and the characters and story were wonderful, complex, and well-fleshed out. Lovely, lovely, lovely. Somebody buy me a copy of this book so I can cherish it forever. I'm really not used to reading historical fiction but this book made me feel like I wasn't. It still amazes me that I greatly enjoyed this book. I like how the author doesn't bombard you with the facts happening during the war but he sparsely disperses it along the way. I also just loved Adi to pieces and her strong character throughout the novel. A fascinating book, evocatively written and i simply zoomed through it. Hardly limited to young adults...this is an excellent first novel by this promising writer.